If you're going to a concert, a show, a special event, or a Minnesota Wild game at the Xcel Energy Center in downtown St. Paul, you need to get all the 411 you can before you head out so you know where you want to park, how much it costs, and where you'd like to eat or get a drink before or after the show, game, or special event at the Xcel. Here's what you need to know. If you're coming in from out of town, check out the hotels listed here in downtown St. Paul. If you park near a restaurant or bar, you might be able to catch a shuttle bus to the Xcel and avoid parking twice. There are three parking garages, called parking ramps in St. Paul, near the Xcel, along with a parking lot. These tend to fill up very quickly, so if you don't get there early, you'll have to park in one of the many other parking garages in St. Paul, all of which are connected to Xcel via the Skyway system. Click on the link for more details. Several bars and restaurants in St. Paul offer free parking and free shuttle buses to the Xcel Energy Center for Minnesota Wild games. These can change with little notice, so it's a good idea to call the restaurant or bar you are considering to be sure it is still offering free shuttle rides. West Seventh Street, which runs southwest from the Xcel Energy Center, has two of the most popular Xcel Energy Canter pre- and post-event hangouts, Cossetta's Pizza and Italian Deli and Tom Reid's Hockey City Pub. There are plenty more options for bars, pubs, and restaurants on this street, too. Click on the link for more ideas on where to get food and drinks when you're seeing a show or going to a hockey game at the Xcel. Head to downtown St. Paul for more places to eat and drink. Check out Great Waters Brewing Company for beer and food and ​Alary's Bar for beers with all the Wild fans that will fit into the place. Tickets for the majority of events at the Xcel Energy Center are sold through Ticketmaster, which adds a "convenience charge" per ticket. 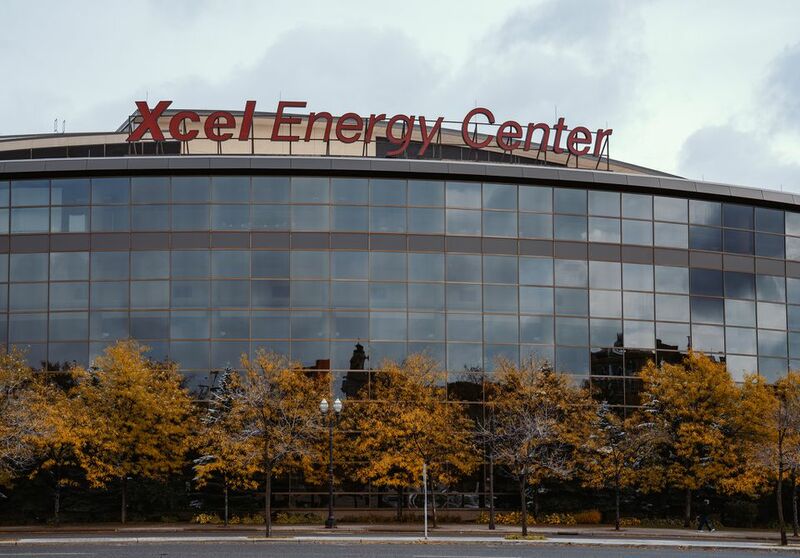 You can save money on tickets by buying them in person at the Xcel Energy Center box office. StubHub and TeamExchange are Ticketmaster-run sites for fans to buy and sell tickets. Depending on demand, tickets can sell for way over face value, especially for Minnesota Wild tickets and for in-demand shows, but occasionally there are bargains to be found. There are quite a few hotels less than a mile from Xcel, so if you are coming from out of town or don't want to drive home after the show, you'll have a short walk back to your room. You'll find a range of prices and many national chains. Among them are DoubleTree by Hilton, Hyatt Place, Best Western, and Embassy Suites. As well as seeing the game or the show, there's plenty more to do in St. Paul and next-door Minneapolis. Discover fun for the entire family including free museums and attractions.